By default, Windows automatically adds icons to local drives as defined in the system and names as they were set during formatting. Most users could care less what the icons are or what the drive name is. But what if you want want to be able to tell your drives apart at a glance? Maybe you want a more descriptive name then “Local Disk (C:)”. Luckily windows (and perhaps other OS’s; I haven’t tested it) has a easy way to do so. How you ask? Our old friend autorun.inf. Click through to find out how to do it. This script allows you to view the contents of the recycle bin in your profile. The first line creates a ComObject and then the second line grabs the Recycling Bin special folder. It then enumerates the items contained in that special folder and removes each of them. The Remove-Item cmdlet includes a switch to turn off confirmation for the removal of the files. It can be removed if you would like to be prompted for each file. Lets face it: We have more passwords than we can ever remember. Whether it’s personal or work, we usually have dozens if not hundreds of username/password sets to remember for various applications and sites. The solution for most people is to reuse their username and passwords across sites. While this may make them easier to remember it also makes it easier for them to be compromised. The common recommendation is to use passwords composed of alphanumeric characters (0-9, a-z, A-Z) and symbols. While that may increase the security of your passwords the likelihood of remembering one instance of “a320#. ?atx!” is small, let alone 30 for a dozen different systems. It’s much easier to remember the name of a pet or a relative/spouse. So how do you get around the need for more secure passwords while actually being able to remember the passwords themselves or instituting expensive biometric systems? One answer is to use a password manager. There are several popular ones available but I favor RoboForm after having used it for several years. Why use a password manager and why choose RoboForm over other solutions? Well, lets dig in below and see! FizzBuzz. Chances are that you’ll need to know it at one time or another if you apply for any programming or development job. Here are a couple ways to do FizzBuzz in a variety of languages. There are alternate ways to do this in each language but these are a few examples of some code that you could use. I”ll update this post over time as I find new examples. This will give you a quick list of Execution Policies on your system and give you a PowerShell prompt. 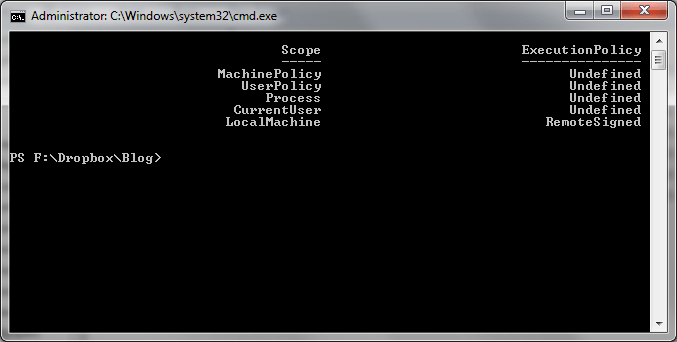 Of course you can always simple run “Get-ExecutionPolicy -list” from the Command Line or PowerShell prompt. You can download bar from the above link or copy the 2 lines above to a text file and rename it .bat. Many people use Google Chrome on their personal computers to browse. It’s likely you use it on your work PC as well if your organization allows. Google Chrome loads most sites with ease, is frequently updated and has many customization options. It’s an all around good choice. It can also make your life as an admin much easier. A browser making administration easier? What magic is this? Well, lets look at some of the options. I finally got around to updating my ESXi server today. Since I don’t have the hardware to run vCenter and thus do not use it I had to do it the manual way. This method involves connecting via SSH but is relatively straightforward. Suspend or shutdown any running VM’s and put the system into Maintainence mode. The next step is to enable SSH on your ESXi Server by going to Configuration > Security Profile > Properties. Start the SSH service and close the popup. Once the zip has been uploaded, open Putty or your preferred SSH client and connect to the ESXi server. Log into the server from SSH and run the following command where <datastore> is the location of the zip we uploaded earlier and <version> is the version number of the file (in this case, ESXi-5.1.0-799733). Once the process is finished reboot the sever. If the update was successful take the server our of Maintainence mode, and resume your VM’s. You’ll probably have to update VMware Tools for your VM’s but your server should now be running properly on 5.1 ( or whatever version you upgraded to, assuming the command isn’t changed/removed). 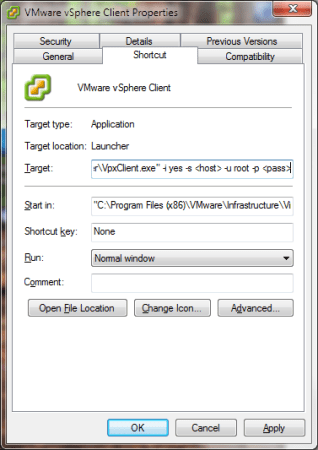 Auto-logins to the vSphere client with the specified host, username and password.